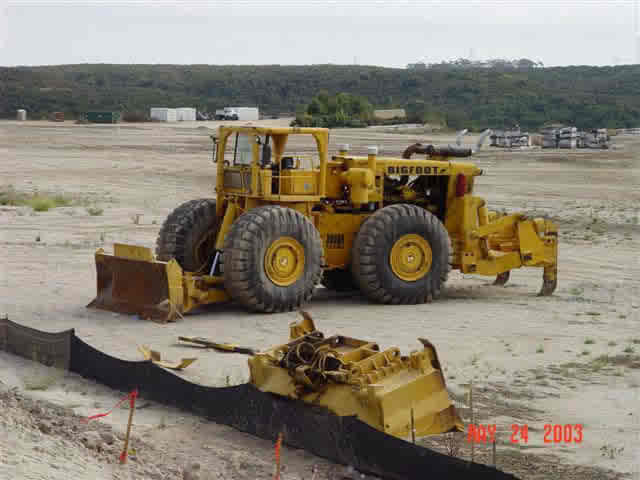 A wheel dozer is basically a big blade to push material mounted on 4 or more wheels. The most common aspect is +the hybrid son of wheel loader and a tracked bulldozer+ particularly used by Caterpillar (you can find HERE a short introduction video), but it can also be more exotic such as the Hough D950 or the mighty Melroe M-880 (video here). 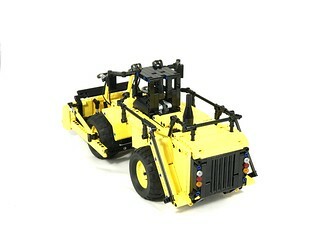 Compared to a classical tracked bulldozer, the wheel loader can’t push the same very high load, and is limited to “clean” ground (without rocks), but otherwise it has the advantage of a higher speed on site and excellent maneuverability, and consequently is mostly use as support vehicle in mining operation. 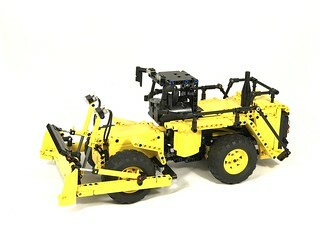 This moc is an articulated vehicle not really based on a real machine but you can find some similarity with a CAT 844 or 854. 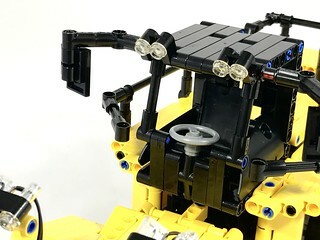 The front part supports the blade and lights.The rear part with a lightly detailed cabin, a working fake L6 engine under an openable hood, a BuWizz controller and some safety handrail. Propulsion is made through a PF-XL motor placed at the rear end of the truck. A reduction ratio of 3/5 is used to the drive train while a 5/3 ratio is used to power the fake engine. The vehicle is 4 wheel drive with a differential on both front and rear axle, plus the rear axle is pendular. 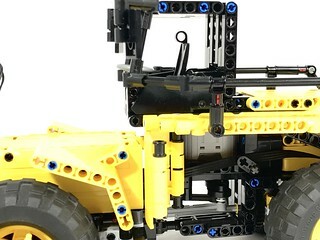 A servomotor is used for steering in a simplified technic than the one used on set 42030 (Volvo L350). The front blade is operated through a single Servomotor. Some reason to this technical choice : Firstly, the blade only moves only from a lower to an upper position with no particular need to be precisely placed. A traditional motor plus linear actuator or worm gear would have made the same job, but would have been significantly slower. So the use of the SM allows a faster move and an intermediate position can also be reached thanks to the use of the BuWizz controller. 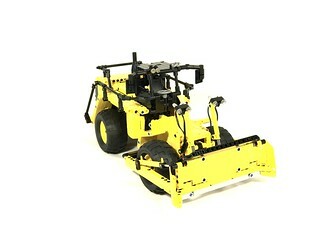 And secondly, even if the SM has a weird shape it remains compact and fitted well in the front part on the dozer. 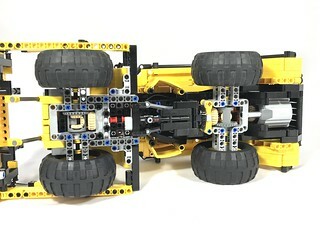 This is a personal creation made of Lego elements, not an official set you can buy in store. 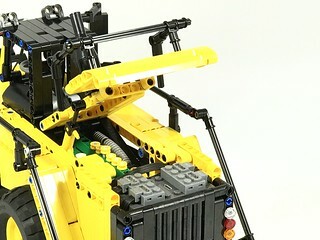 This MOC is currently not available for sale through MocHub or for download.